Bud Light’s team-specific cans are back once again for the 2017 NFL season, with 28 new designs that feature the official logo and catchphrase or rallying cry for each NFL franchise. And for the first time, this initiative is being rolled out in both 12-ounce cans as well as 16-ounce aluminum bottles. In addition to showing off your team pride, each can features a Snapcode that will unlock a chance to win Super Bowl LII tickets, an interactive Bud Bowl-style game and team-specific Snapchat filters when consumers take a photo of the Snapcode. As you can see in the photo above, Cleveland’s can is a reference to the Dawg Pound, the fans’ famous end-zone abode at FirstEnergy Stadium, with the slogan “Beware of Dawgs”. This year’s NFL cans are currently on shelves in select markets, and will be available nationwide later this month. You can also snag a bottle (not a can) during any home games at FirstEnergy Stadium. 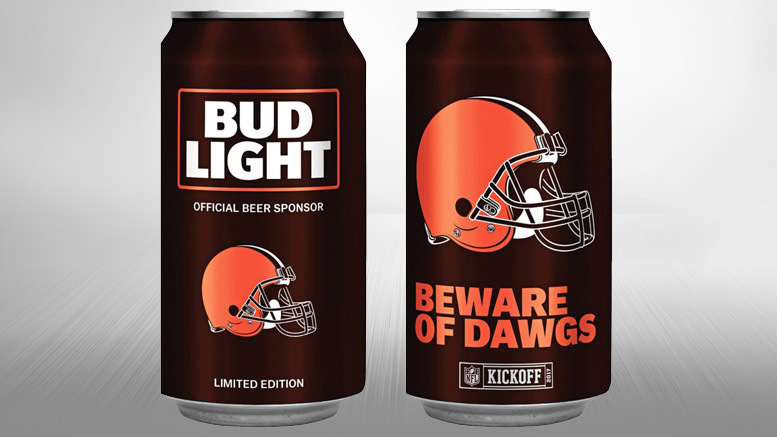 What do you think of the new Bud Light Cleveland Browns can?